My mother loved to cook, especially when it came to making soup. Her favorite, which she believed solved ALL of the woes of the world, whether it was health related, a pick me up, or a sympathy soup, was Homemade Chicken Noodle Soup . Mind you, the word, ‘homemade’ has to be included in the process because not every soup would do. Even the esteemed ‘Campbell’s’ company, and all of their chubby cheeked cherubs touting the ‘mmm-mm good’ slogan, was no contender for my mother’s soup. Many a cold, icy winter day in Fairbanks, Alaska, or the Upper Peninsula of Michigan, I would crave my mother’s soup and wish she were in my kitchen cooking away. Well, it’s been many years since I’ve tasted her version; she died on Christmas morning 2003, but I can always feel her presence and the recall fond memories whenever I make a batch of Homemade Chicken Noodle Soup. Today was one of those perfect Fall Saturday’s-the sky was sunny, the weather was warmish, and the yard was being prepped for winter-and NOT by me. I escaped that duty this year because I was cooking. I’d been wanting to cook up a batch of soup for a couple of weeks now and finally got around to making sure the ingredients were in the house…mostly, that meant that I had fresh veggies and a roasting chicken. I start my soup with a big pot and cold water. I like to plop the chicken in the pot, once its been rinsed thoroughly, and bring to a gradual boil. 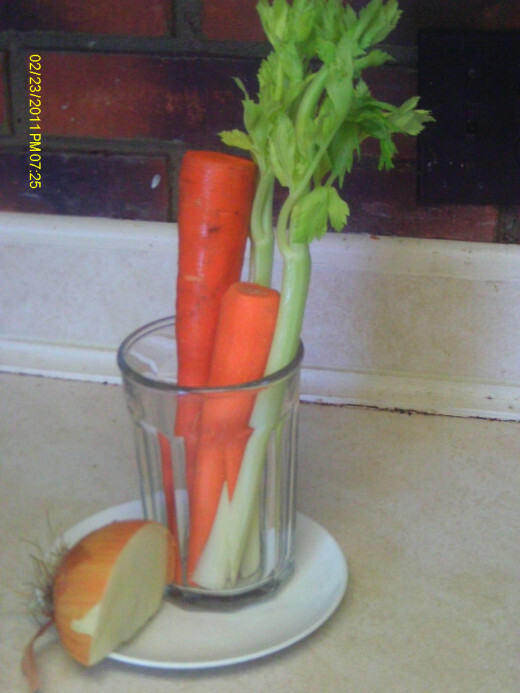 While the bird is in the pot I start chopping the vegetables: carrots, celery, and onion. Once the water has come to a boil I turn it to simmer, add the seasonings and after about an hour, I add the veggies, continuing to simmer for about another hour-the longer, the more tender the chicken. Today the bird simmered in the pot, the house smelled yummy with the fragrance of thyme and chicken, and by the time I pulled it out of the pot at 5:30 p.m. it was falling off of the bone. I served steaming bowls of soup to all of the yard hands with stacked sandwiches of ham and turkey. What chicken escaped going back into the soup will be used for another meal. Fill a large pot with 12 C of cold water. 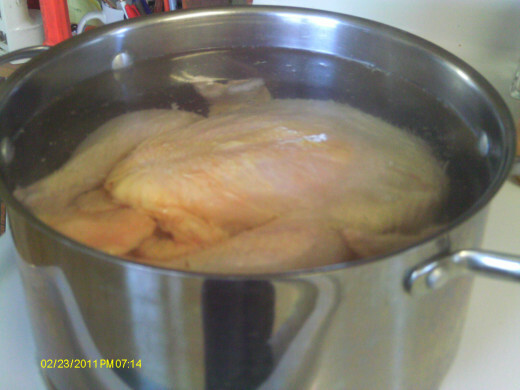 Thoroughly rinse chicken under cold water and place in the pot of water. Set temperature to High and bring to a boil. Once water starts to boil turn Temp setting to simmer. Add thyme, poultry seasoning, salt, and pepper. Adjust seasonings to your taste preference. 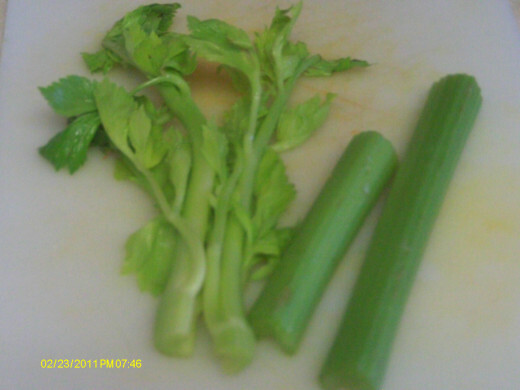 Add celery leaves and simmer for 1 hour. 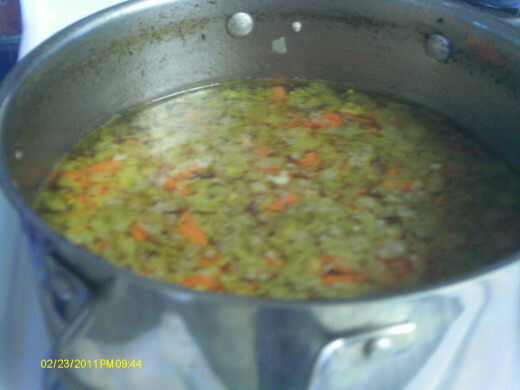 Add chopped celery, onion and carrots and continue to simmer for another hour or until vegetables are tender and chicken is falling off of the bone, (usually within 2 hours). Remove chicken from the pot and place in a large serving bowl to cool slightly before beginning to remove meat from bones. 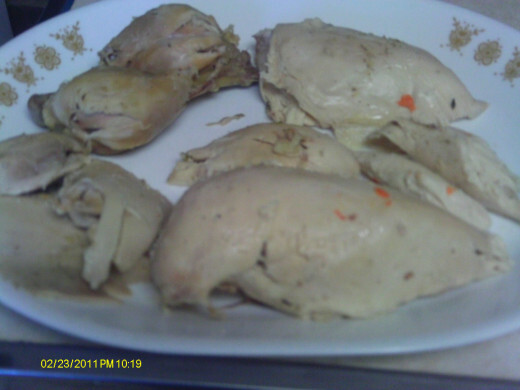 Place large pieces of chicken, (breasts, thighs and legs) in a container and refrigerate for another meal. Remove meat from bone and cut into bite sized pieces and add to the soup pot. 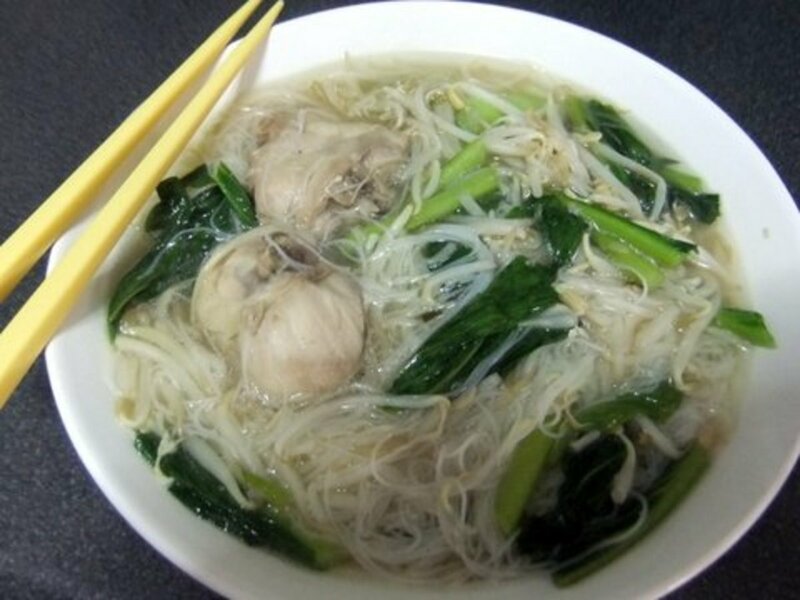 You should have at least 1 C of 'tidbits' from the bones, but if not, take one of the chicken pieces and cut into pieces and place in the soup pot. Add one 6-8 oz package of thin soup noodles or 1/2 C rice if making chicken rice soup. Simmer for 7-10 minutes or until the noodles are cooked. Serve with Italian or French bread. 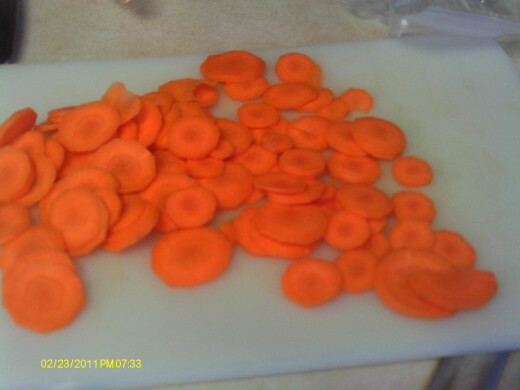 If you refrigerate the soup for several hours until chilled thoroughly, (overnight works best), you can easily skim the fat off the top because it will rise; and if overnight, it will harden. Remember to stay flexible with your recipe for your family. 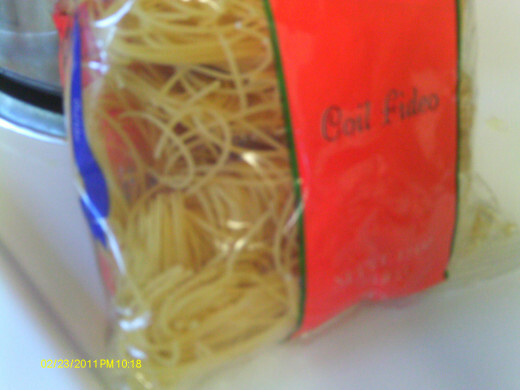 If the noodles have soaked too much of the broth overnight add a cup or two of chicken flavored stock or soup broth. Note: There is an initial prep time of about 15 minutes to rinse the chicken and chop the vegetables. Then there is a second prep time following the chicken being removed from the soup and the meat picked off of the bones. Be sure to keep the tiny bones from going back into the soup as it may get caught in someone's throat if swallowed. Remove the larger pieces of chicken and place in the refrigerator for a future meal. Take the smaller pieces and chop into bite sized pieces and return to the soup-about one cup. Now that you've read the instructions how likely will you be to make this easy soup recipe? Not very likely- I don't like to cook and this looks like too much work. 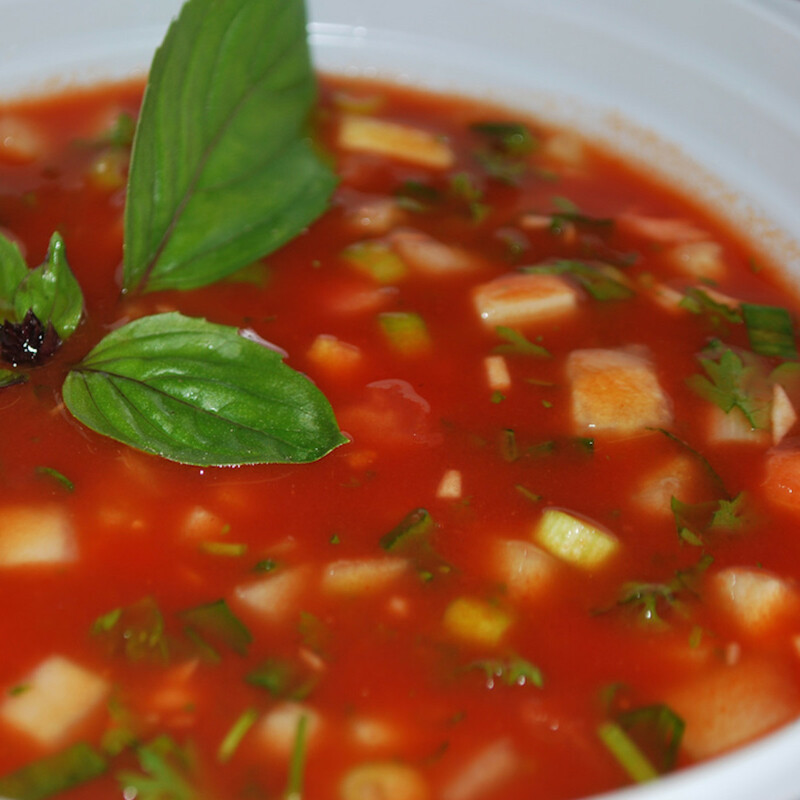 Join me as I take a look at the ingredients in one of your favorite soups and home remedies. You might be surprised what we find on this journey. This is a family recipe my grandmother made often. Grandma's Homemade Egg Noodles is always a favorite. I do that often myself, Sherry. Either way, it is so good, isn't it? Thanks for stopping by. I make a similar chicken soup, but usually I roast a chicken first and then use the carcass and leftovers to make the soup. Wow. A great recipe hub, will definitely add this to the list of my recipes. Thanks for sharing. Hi Alecia-thanks for the pin. It has been so chilly now, I'm about due for more soup. Stephanie-I agree-it is so nice to have at least two meals planned from one pot. Thanks for commenting. 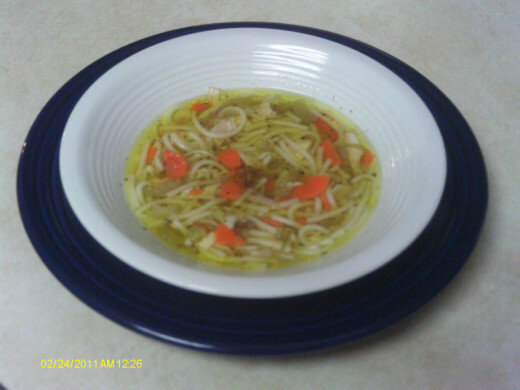 Homemade soup is a wonderful comfort food anytime, and homemade chicken soup is the best! I like the fact that you can cook the whole chicken, have your soup and still have chicken left for another meal! Yummy! This is a tasty recipe, I'm definitely going to pin so I can try it. Homemade soup tastes so good during this time of year. Voted up and shared! Aha, I can make this. However, I don't use some of the seasoning ingredients you have mentioned here. Hi justateacher-LOL how coincidental. I'll check out your recipe as well. Thanks for commenting. This sounds so good that I will have to try your version the next time I do soup! I just made my chicken and noodles tonight, but didn't add the veggies you did...It's kinda funny, too, that I wrote my first recipe today and it was my chicken and noodles! Hi Lisa...Mine too, and unfortunately, mom isn't around anymore to make any soup. Thanks for the vote UP. :) Enjoy mom when she arrives. Hi divacratus-thanks for your comments here. 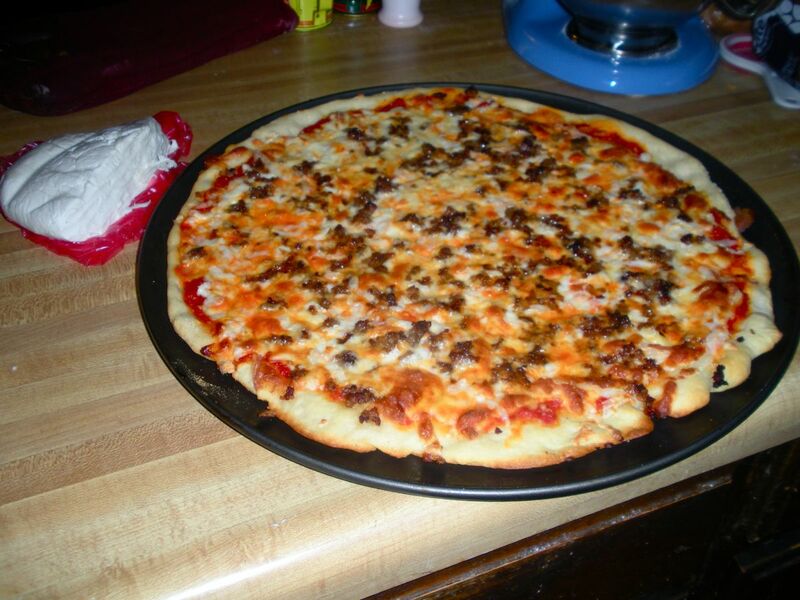 It is probably the number one comfort food in my home. Chicken noodle soup is absolutely yummy and I have it whenever I'm down and out. It's such a comfort food. Leslie-what a bummer that you have the bug! I hate feeling flush (and foolish...aka 'Kim' LOL ) I hope you are feeling back to your old sparkly energy soon. Boy, I wish I could package this up and airmail it to you STAT (that's nurse talk for immediately). That was sweet that Vincent cares enough about his buddy in poetry to send you the antecedent to the flu and other life's miseries. I'll have to shout a thank you out to him up in that vast, cold (and wet) north. I don't envy him that weather when I still have blue skies and warm temps. I hope you feel better soon...thanks for dropping by and yes...learn to cook up a batch of soup and keep it in the freezer for those down times. :) Take care, Leslie. Hi, honey! Vincent just posted this recipe to my fb page cause i have the flu.. It looks soooo yummy and reminds me of my grandmother! I asked him what time you'd be arriving to whip it up for me...lol..
Hi Alocsin-oh, it is much better than Campbells. You're right - too much sodium. I would like to suggest that you make this soup BEFORE you get ill. (Who feels like trying a NEW recipe when they are ill?) Get a handle on how easy it is to make and enjoy it while you are well. I imagine this tastes better than the Campbell soup variety, which has always been too salty for me. I'll save this recipe for when I get sick next. Voting this Up and Useful. Carter-if you can make it here to NC ANYTIME, I will certainly cook up a batch of homemade chicken noodle soup and anything else you would like, haha. I just finished off the very last bowl for lunch today. :) Thanks for your comments and votes. Hi Dianna-you better believe it hit the spot up there in Alaska. It was sometimes minus 40 degrees! Thanks for your feedback. I'll bet chicken soup as even more wonderful in such a cold place as Alaska. I love the way you shared your cooking experience. Love your version here. Thanks for sharing. Donnah75-wise family, your in-laws, and good for you for not resorting to the canned soups. I can hardly stand the taste of canned anything now, since I've gone to so much fresh or frozen. Thanks for your comments. Hi Ruby-sorry to hear of your condition HOWEVER, my suggestion: make it chicken soup and skip the noodle and / or pasta part all together. 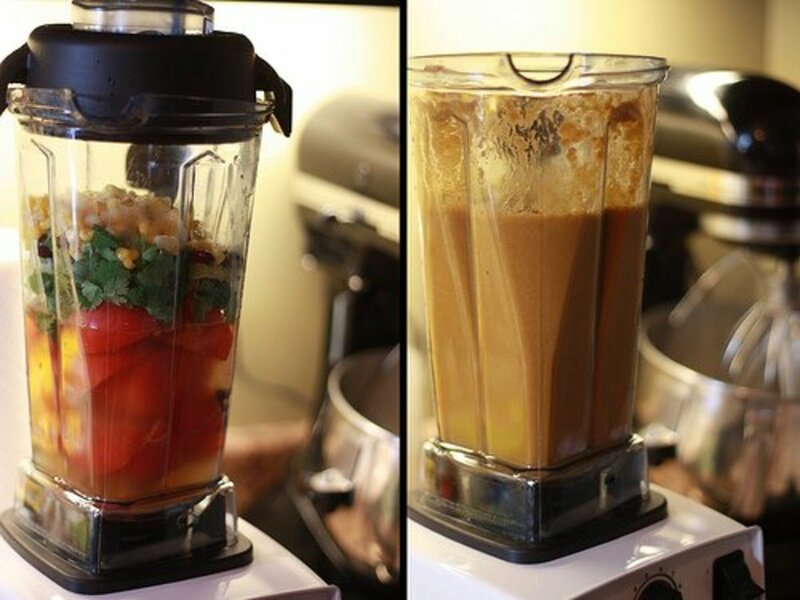 It's just as tasty and probably a whole lot healthier. Thanks for reading. Very delicious hub ~ voted up, interesting, & useful. Since I got married, I haven't had soup out of a can. My husband comes from a family that doesn't understand canned soup, and now I know why. Home made soup is so much better. This looks great. Voted up and sharing. 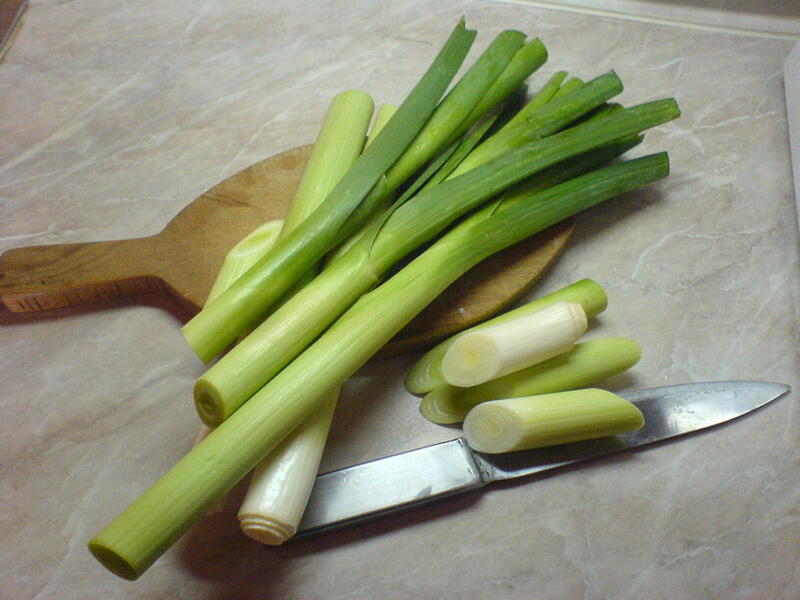 People will need this recipe as the weather changes and germs begin to spread! Oh, yes, I do remember mom's homemade chicken noodle soup. I think I got the talent for making soups from her as I make many soups (just made an awesome clam chowder and of course my Brunswick stew which is more soup than stew). After I wrote about Campbell's chicken noodle soup, and told people about the "white slime" you should get a lot of readers for this hub. Great recipe and I, for one, will be trying it as soon as we have chicken again.